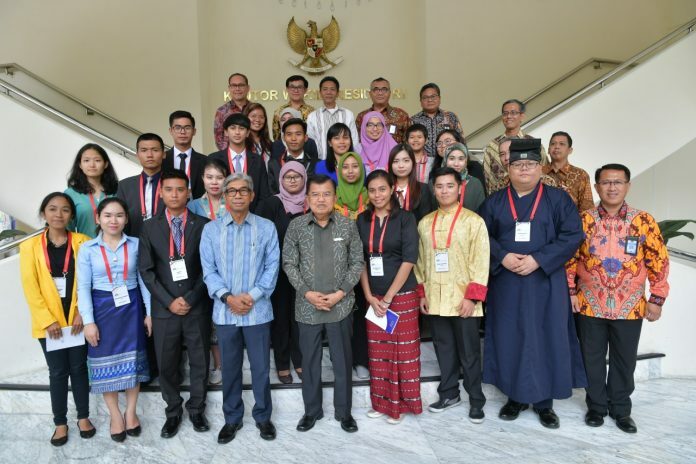 THREE Indonesian ministries are involved to designing this interfaith youth camp for ASEAN young people: Foreign Ministry, Ministry for Human Development and Culture, and Ministry for Religious Affairs. The program is called AYIC 2018 (ASEAN Youth Interfaith Camp) with 24 participants from some ASEAN countries including representatives from the host country Indonesia. AYIC happened in Indonesia with host cities namely Jakarta, Yogyakarta, and Bali, from 28 October to 4 November 2018. The Religious Harmony Office of the Ministry of Religious Affairs was officially authorized to host this event. Explained to Sesawi.Net by Mr Paulus Tasik Galle from the Religious Harmony Office of the Indonesian Ministry for Religious Affairs, AYIC 2010 aims with these following objectives. “As host of AYIC 2018, we aim to introduce the very Indonesian pluralistic society in terms of various religions and cultures. We have to boost morale among ASEAN youth that we have lot of things in common: pluralistic society,” says Galle. “Last but not least, we are also called to groom future’s potential leaders with their strong interfaith spirit in ASEAN countries,” adds this government official referring to AYIC’s framework of reference. AYIC 2018 is a follow-up event with the same name of the program in 2017 happening in Jombang of East Java where all participants attended workshops and discussion at local Islamic High School. But AYIC 2018, says Galle, was held with some more extensive “events” including courtesy visits to several religious spots including the Catholic Cathedral Church and Istiqlal Grand Mosque –both in central Jakarta—and met with their top officials including Jakarta Archbishop Msgr. Ignatius Suharyo. A courtesy visit was also made to Indonesian VP Jusuf Kalla who has also been considered as the nation’s influential Muslim figure despite other figures from the Nahdlatul Ulama and Muhammadiyah –the nation’s most moderate Islamic organizations. “I am very happy to participate this program –an international event that I can learn how to practice social tolerance and to learn about our pluralistic society in ASEAN countries,” she writes to Sesawi.Net. “As an Indonesian member, I was strongly motivated to exercise mutual respect and boost morale to ink commitment to fuel the spirit of tolerance,” she concludes. “I was very excited to be elected as AYIC participant from Cambodia. My excitement was soon followed by a wave of worries and concerns: representing my country at such a prestigious youth event. Fortunately, my fears were laid to rest at day one of the event; even though youth participants that I met were of vastly different socio-economic levels, everyone bonded really well and caring like family,” writes alumnae from Pannasastra University of Cambodia (PUC) majoring in International Relations. “To my opinion, Indonesia is the largest nation among ASEAN countries and possible the world’s most pluralistic society. I was so amazed by its ‘unity of diversity’,” she writes. In Jakarta: Istiqlal Grand Mosque and the Catholic Cathedral Church. In Magelang, Central Java: the world’s largest Buddhist Borobudur Temple and the Buddhist Mendut Temple. In Yogyakarta: Hindu Prambanan Temple, Great Mosque in Kotagede, Mataram Kingdom, Gadjah Mada University and Ganjuran Catholic Church. In Bali: Puja Mandala, Hindu Indonesia University, Hindu Besakih Temple, and Den Bencingah Temple. “I was very happy to have discussions with Indonesian religious leaders and scholars from various religious backgrounds and two high educations namely Gadjah Mada University and University Hindu Indonesia. Not to mention that, I was given the greatest honor to pay courtesy call with Vice President Jusuf Kalla. I got to learn about his leadership in celebrating the diversity among races and religions. I can say it was a life-changing experience,” she writes. “Based on what I learnt from conversation with various religious leaders, the multicultural societies in Indonesia, I personally think that it is important to engage and interact with one another as a form of educating the general public on cultural diversity and spurring discussions on different levels about a specific value. It is essential in the pluralistic society that consists of a solid philosophical foundation for peace as well as the practical aspects of interactions that would make harmonious co-existence long-lasting and permanent. I recognized the fact that Indonesia is a peaceful country which encourages mutual understanding, tolerance and respect towards people of other religions and cultures. In addition, it is also quiet important for all to understand that establishing peaceful co-existence in a pluralistic society requires collaborative and sincere efforts among its people. Jakarta Archbishop Msgr. Ignatius Suharyo.